Hydroelectric power plants located in the Columbia River Basin account for about 29 gigawatts, or between 33% and 40%, of U.S. hydroelectric capacity and produced 44% of the total 2012 U.S. hydroelectric generation, while Canada’s portion of the river accounted for 92% of all electricity generated in the province of British Columbia in 2012. 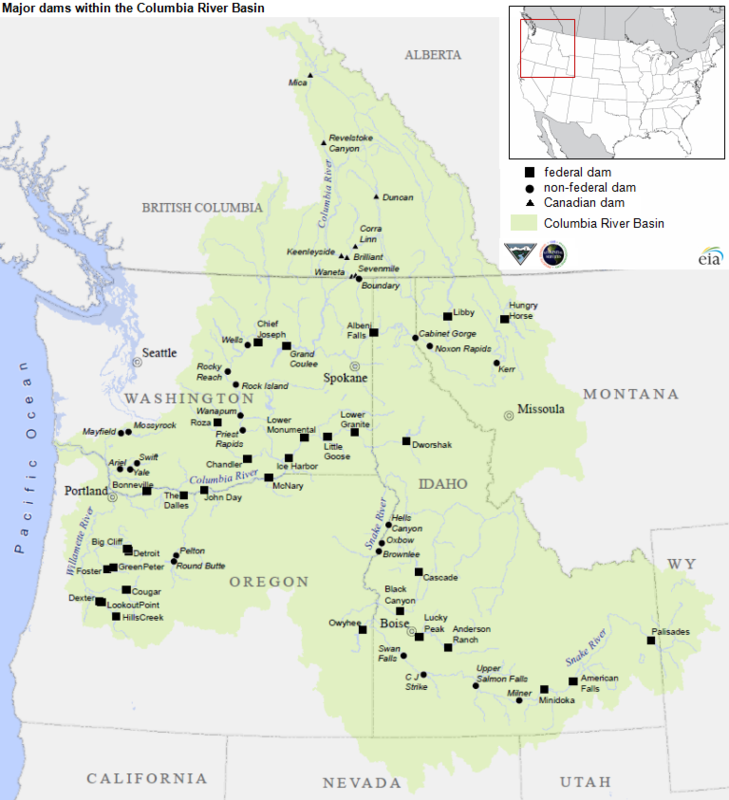 Almost 70% of the river basin’s U.S. capacity, owned and operated by the U.S. Army Corps of Engineers and the U.S. Department of Interior's Bureau of Reclamation, is marketed by the federal Bonneville Power Administration, another 19% is owned and operated by municipal utilities, and the remaining 12% is privately held. BC Hydro and Power Authority, a Canadian provincial crown corporation similar to a state-owned utility, operates 31 hydroelectric power facilities. The Columbia River Treaty (CRT), ratified in 1964 after 20 years of negotiations, covers three storage dams in British Columbia and is currently being renegotiated, with new financial, energy, and environmental factors raising concerns. The river basin’s productivity is attributable to steep gradients that produce a 6.8 gigawatt net summer capacity at Washington’s Grand Coulee Dam, the biggest U.S. hydroelectric power plant and the world’s sixth biggest, as well at 2 gigawatt-plus production at the Chief Joseph and John Day plants, the 1 gigawatt-plus output at the City of Seattle's Boundary plant, and many under-100-megawatt facilities. The Columbia River’s source is in the Canadian Rockies on the Canadian side of the border and the river flows 1,214 miles through Idaho, Oregon, and Washington, with tributaries reaching into Montana, Nevada, Wyoming, and Utah. Much of the Columbia River Basin hydroelectric resource is delivered to the Los Angeles region via the Pacific Northwest-Southwest intertie, two 500-kilovolt transmission lines completed in 1971. Of BC Hydro’s three dams on the Columbia River, one generates electricity and two provide water storage for downstream U.S. hydroelectric power production.